OU is the team that gets hosed this year. Looks like Ohio State got hosed. One thing you can be certain about is someone always gets hosed. Location: Mercedes-Benz Stadium - Atlanta, Ga. Location: University of Phoenix Stadium - Glendale, Ariz. Location: Rose Bowl - Pasadena, Calif. Location: Mercedes-Benz Superdome - New Orleans, La. ^^^Well worth 4:28 of my life. The NCAA placed Oregon's athletics department on two years' probation. -- Director of men's basketball operations Josh Jamieson participated in or observed individual voluntary workouts at least 64 times. <----Wut? -- A women's basketball assistant strength coach participated in on-court activities both during and after practices, including stepping into drills. -- An adjunct instructor altered a course grade from an F to a B-minus for a women's track and field student-athlete, which allowed her to remain eligible and earn a degree. -- The football team posted personal information about prospects on an electronic reader board in the football facility during their visits to campus. I know it seem's like a small deal but it's not.... the rule is to make certain every school has an equal amount of practice while still giving the players time to complete the student part of student-athlete. The rule is in place to try and make certain that the sport does not completely overwhelm the athlete, as the NCAA does understand that 99% of these kids do actually need an education as they are not going pro. When I was coaching football the number of practices, the hours of days you are allowed to practice, and the total hours you are allowed to practice are highly regulated. This is typical from little league though pro's and every coach knows the rules. Coaches already push this rule to the extreme limit by holding 'volunteer' weight training classes and 'volunteer' player led practices, where every player on the team knows if you don't 'volunteer' you're never going to play. Reading the article it appears the coach was participating in these 'volunteer' player led practices. The Pac-12 as a conference is in serious trouble financially and not doing much better on the football field. The conference failed again to get a team in the four-team college playoff, further pushing it into irrelevance nationally. To make matters worse, Washington State was passed over for one of the New Year’s Six bowls, drastically reducing the conference’s stature and financial payout. In fact, a four-part series published last week by John Canzano of the Oregonian, extensive research showed the conference is paying almost $7 million annually in rent for its headquarters in an extremely expensive part of San Francisco. Scott also draws a $4.8 million salary, more than double than that of other Power Five commissioners. That's the same regurgitated crap spewed by John Canzano of the Oregonian last week. What's the deal? Our local reports are not even smart enough to come up with the own material for an article?!? I thought the very same thing when Acca posted it. I just thought he was trying to reemphasize it by posting it twice. 1-8 in bowl games last year. Hopefully can improve substantially this year. First up in Arizona State vs Fresno State in the Vegas Bowl. Fresno State was a heckuva football team. 12 wins and a Mountain West Championship win against Boise State in Boise on a very cold and snowy night. Well...lucky that Utah doesn’t play Oregon in 2019. 0-2 in the pathetic bowl. 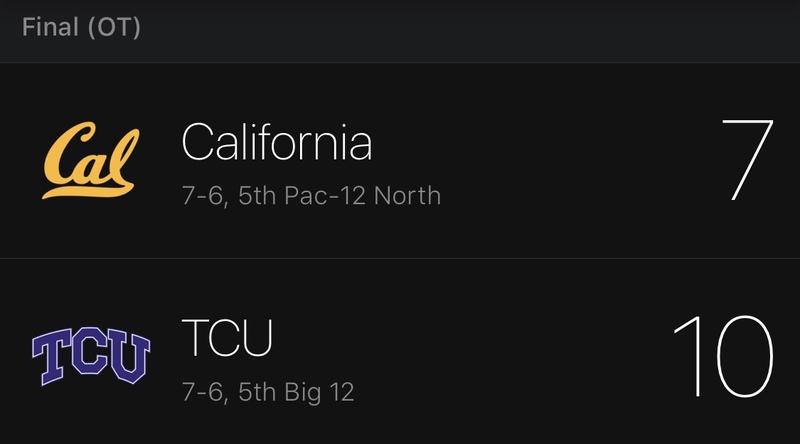 The game goes to OT at 7-7 and almost ends on a pick 6, but TCU ends up kicking a field goal for a 10-7 win. Yep, another close win. 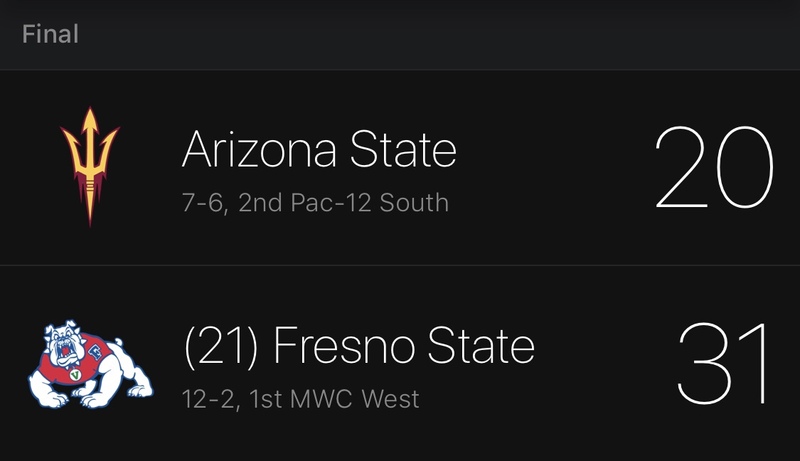 The Pac is 2-2. Already doubled the win total from last year. Hopefully Oregon can hold on. They finally got their first score of the game in the 4th quarter.